Hi, I’m Heather and I’m a procrastinator. I know most everyone can admit to some procrastination here and there. We all have tasks we put off for one reason or another. I’m sure there is at least one person out there who is a more extreme procrastinator than I am, but I don’t know them personally. I try to blame my procrastination habits on the fact that I am busy, and in part that is true. I often feel overwhelmed by all the stuff I need to do, and rather than focusing on any one thing to get it done, I’d rather shove it all to the back burner and go do something fun instead. Sometimes procrastination can work in one’s favor. Who knows how much money I have saved by putting off shopping trips for new clothes or shoes? I’ll just wear these scuffed and worn shoes until the soles literally fall off and I am left with no choice than to buy new ones! Or, at work, procrastinating on some menial task often results in that task slipping through the cracks of time, never to be considered again. More often than not, however, procrastination has unpleasant results. Late nights (or all-nighters) of despair and self-loathing as a long-put-off task suddenly becomes urgent. Ok, so that hasn’t happened since college, but you know what I mean. There is a workplace equivalent, where something is suddenly due and desperate measures have to be taken. All the while you feel crappy and swear that you will never let this happen again. It used to be that I only procrastinated on things that I didn’t like. Math homework. Vacuuming. Getting out of bed in the morning. More recently I have found myself procrastinating on just about everything, even things I really want to do. It is very easy to busy yourself with tasks like, organizing your file folders or syncing your iPhone and iPad to your computer. When you’re done you feel like you accomplished something, but really, how necessary was that? It’s pretty likely that I am being too hard on myself. I often forget to look at my actual accomplishments. I tend to only see what I have NOT done, and ignore all of the progress I have made in my life. I mean, obviously I don’t procrastinate on EVERYTHING, or I wouldn’t be where I am right now. There are plenty of online resources available to tackle procrastination. I am a big fan of Zen Habits, and get these delivered to my inbox. 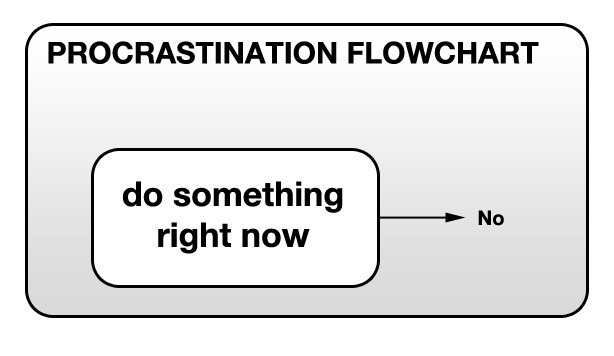 There was also this fabulous post about what goes on inside a procrastinator’s brain. I’m pretty sure that mine has TWO instant gratification monkeys. Of course, as you’ll see in the above-mentioned article, going online isn’t exactly the best idea for a chronic procrastinator. Where am I going with this post? Basically I was just procrastinating my morning exercise routine and realized that I hadn’t done a post in a while, so I thought I’d sit down and do one! Now it’s almost 7 am and if I don’t stop writing now I won’t have time to exercise before I have to get ready and leave the house. Do you struggle with procrastination? Did you just read my blog post in order to avoid doing something else? Have you found ways to be more productive and keep your instant-gratification monkey from taking the wheel?